Calling all carnivores, itÕs time to march in the meat parade! 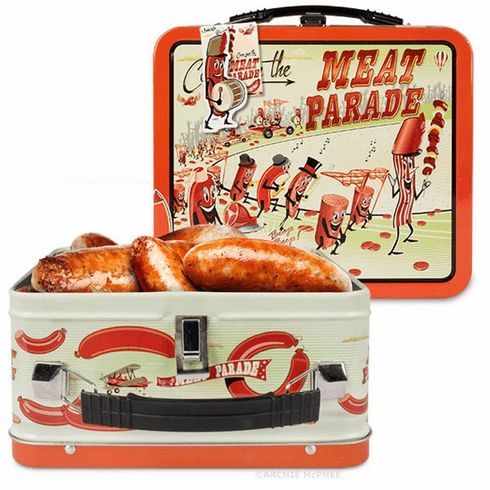 This 8" x 7" x 4" (20.3 cm x 17.8 cm x 10.2 cm) retro lunchbox is covered with marching meat and big-band meat by-products! One side shows the celebratory beginning of the parade, the other side shows the parade marching into a grinder. YouÕll want to fill it with bacon, steak and pork chops. The lunchbox is made of metal, has a plastic handle and also includes a vinyl dangle.